View the entire range of inline hydraulic valves from SPX Flow: Power Team. Including 'Load lowering valve', 'Sequence valve', 'Pressure reducing valve' & 'Counter balance valve'. At SGS Engineering we have an entire range of inline hydraulic valves from SPX Flow: Power Team just waiting for you to discover. This range of pressure safety valves includes 'Load lowering valves', 'Sequence valves', 'Pressure reducing valves' and 'Counter balance valves' – meaning there’s sure to be the right model for you. Take a look at our extensive selection below of pressure regulating valves to fix all your pressure reducing valve needs. Application - Precision metering for controlled cylinder piston return. Operation - Permits free flow when extending cylinder, built-in pressure relief and "PosiCheck®" locks and holds load in raised position until operator opens valve. May be pre-set to provide consistent metered return, or operator may select rate of return with each actuation. Has 3/8" NPTF ports. NOTE: Pressure relief valve setting is 830 bar. Operating pressure is 700 bar and max. flow rate is 19 l /min. No. 9596 – Load lowering valve. Weight 1 kg. Application - Used when one cylinder in a multi-cylinder application must advance before any other. Operation - Pump is connected to port "P" and separate cylinders to ports "A" and "B". When pressure is applied to port "P", cylinder "A" advances. Cylinder "B" will not advance until a predetermined pressure setting is reached in cylinder "A". Pressure setting is adjustable from 35 to 550 bar with adjustment screw; factory pre-set at 70 bar. Has 3/8" NPTF ports. No. 9597 – Pressure release valve with control sequencing. Weight 2.5 kg. 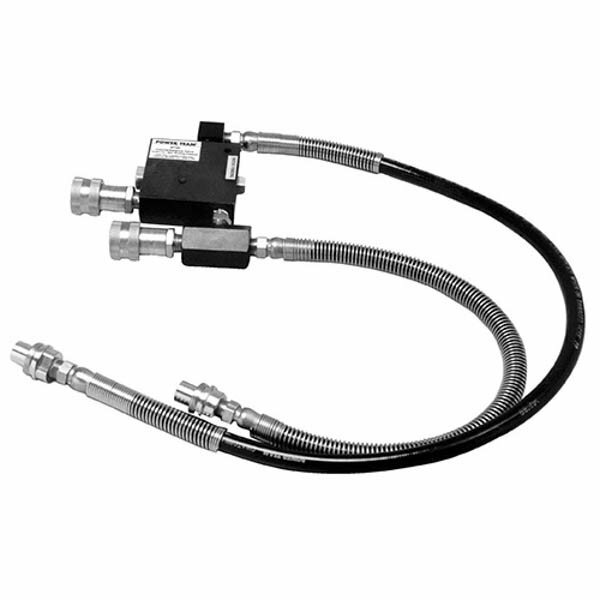 Application - Provides complete, independent pressure control to two or more clamping systems operated by a single power source. Operation - Can be used to provide different pressures in various stages of a single system. Virtually zero leakage across valve means each system can be operated by a single continuous pressure source. Adjustable from 70 to 350 bar at outlet port "B" (secondary). Has 1/4" NPTF ports. No. 9608 – Pressure reducing valve. Weight 2.6 kg. Application - Double-acting cylinders. Provides positive holding and controlled, "chatter-free" lowering of a load. Operation - Load is raised at flow rate of pump, and held when pump is shut off. When the pump is shifted to "retract", the counter balance valve will continue to hold the load until system pressure exceeds pressure caused by load. The load can then be lowered smoothly to the flow rate of the pump. The counter balance valve is designed to operate with pumps having a high pressure flow rate of up to 1,9 l /min. and cylinder ratios of 3 to 1. No. 9720 – Counter balance valve, including two male and two female half two hydraulic hoses, fittings and dust caps. Weight 4.5 kg. No. 9721 – Same as 9720, but does not include couplers, hoses, fittings and dust caps. Weight 4.2 kg. At SGS, we’re committed to ensuring that you can find precisely what you need when you’re looking for a standard or hydraulic pressure relief valves. That’s why we stock a wide variety of different types of hydraulic valve, including inline hydraulic pressure relief valves and other quality pressure reducer valves. What’s more, with products from Power Team, you can trust that we stock high quality, technically sound items that are competitively priced. Browse our listings of standard and hydraulic relief valves today and when you find the right model, simply place your order with SGS. We also pride ourselves on our customer service, so if there’s any information that you need on everything from choosing the right safety valve, to which pressure safety valve is the best option for you, then please don’t hesitate to get in contact. Our friendly and highly knowledgeable customer service team is more than happy to help with any question that you might have, so make sure you give us a call on 01332 576 850.